In a highly competitive global digital therapeutic devices market, savvy players are focused on collaborations and partnerships to improve their technical expertise for competitive gains. Established players are also tapping into the emerging economies of Asia Pacific that have vast growth potential in the digital therapeutic devices space. The global digital therapeutic devices market is primarily driven by the rising use of technology for treating medical conditions. The demand for technologically advanced products for treating medical conditions coupled with rising disposable incomes is positively influencing the global digital therapeutic devices market. Several governments are also supporting the adoption of digital therapeutic devices that marks a significant change from traditional healthcare practices. On the downside, the high price factor and risk of data breach are slowing the adoption of digital therapeutic devices. According to projections by Transparency Market Research (TMR), the global digital therapeutic devices market will expand at impressive CAGR of 15.6% during the 2017-2025 forecast period. At this pace, the market will attract a revenue valuation of US$2,082.3 mn by the end of 2025 from US$590.8 mn in 2016. 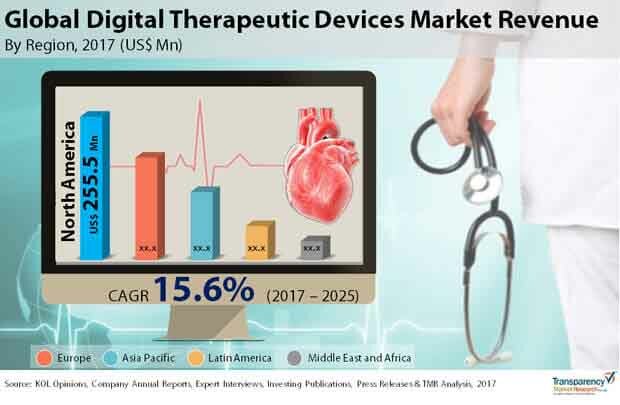 Based on product, the global digital therapeutic devices market has been segmented into pain management devices, respiratory therapy devices, rehabilitation devices, and insulin pumps. Among them, the segment of insulin pumps constituted the leading market share in 2016 due to the increasing prevalence of diabetes. In terms of application, the digital therapeutic devices market has been segmented into preventive and treatment/care. Of the two, treatment/care is anticipated to hold the leading share and display a significant growth rate over the forecast period. The segments of the global digital therapeutic devices market depending upon end user are B2C and B2B. While B2C is further segmented into patients and caregivers, B2B is sub-segmented into providers, payers, employers, pharmaceutical companies, and others. B2B held the leading market share in 2016 on the back of increasing adoption of digital therapeutic devices by employers and health insurance companies for ease of processing medical claims. Geographically, the report gauges the potential of digital therapeutic devices market in the regions of North America, Asia Pacific, Europe, Latin America, and the Middle East and Africa. In 2016, North America accounted for the leading share in the global digital therapeutic devices market. The early adoption of technology coupled with increasing investment in digital therapeutic devices companies through government funding, venture capitalists, and mergers and acquisitions are supporting the growth of this regional market. For example, in March 2017, Livongo Health – the developer of an app for diabetes management and the developer of a cellular-connected blood glucose meter raised US$52.5 million by growth funding. The Europe market for digital therapeutic devices market is predominantly led by Germany, France, Spain, the U.K., and Italy. Amongst them, the U.K. and Germany constituted the leading share in this regional market. Increasing prevalence of chronic diseases such as cancer, diabetes, and obesity and government initiatives for adoption of technology for treating medical conditions are contributing to the growth of Europe digital therapeutic devices market. However, Asia Pacific is expected to display the leading growth rate over the forecast period. Increasing penetration of smartphone and government initiatives to promote the adoption of technology for treating medical conditions is likely to propel the growth of this regional market. Leading companies in the global digital therapeutic devices market include Proteus Digital Health, WellDoc Inc., Noom Inc., Propeller Health, BiogeniQ Inc., Claritas MindSciences, Jintronix Inc., Zest Health LLC, HealthMine Inc., BioTelemetry Inc., Digital Twine health Inc., Firstbeat Technologies Ltd, Big Health, Dthera Sciences, Virta Health Corp, Pear Therapeutics Inc., Blue Mesa, Meru Health Inc., Canary Health, Glooko Inc., Nanobiosys Inc., Digital Therapeutics, Omada Health Inc., Ginger. Io Inc., Livongo Health, and 2Morrow Inc. This report on the global digital therapeutic devices market analyzes the current and future prospects of the market. The report comprises an elaborate executive summary, including a market snapshot that provides overall information of various segments and sub-segments. The research is a combination of primary and secondary research. Primary research formed the bulk of our research efforts along with information collected from telephonic interviews and interactions via e-mails. Secondary research involved study of company websites, annual reports, press releases, stock analysis presentations, and various international and national databases. The report provides market size in terms of US$ Mn for each segment for the period from 2015 to 2025, considering the macro and micro environmental factors. Growth rates for each segment within the global digital therapeutic devices market have been determined after a thorough analysis of past trends, demographics, future trends, technological developments, and regulatory requirements. A detailed qualitative analysis of factors responsible for driving and restraining market growth and future opportunities has been provided in the market overview section. This section of the report also includes market attractiveness analysis that provides a thorough analysis of the overall competitive scenario in the global digital therapeutic devices market. Market revenue in terms of US$ Mn for the period between 2015 and 2025 along with the compound annual growth rate (CAGR %) from 2017 to 2025 are provided for all the segments, considering 2016 as the base year. Market size estimations involved in-depth study of services and product features of different types of services. Additionally, market related factors such as increasing preference for technologically advanced services, product innovation, and increasing prevalence of diabetes and other chronic diseases in various geographies and historical year-on-year growth have been taken into consideration while estimating the market size. Based on product, the global digital therapeutic devices market has been segmented into pain management devices, rehabilitation devices, respiratory therapy devices and insulin pumps. Based on application, the digital therapeutic devices market is segmented into preventive, treatment/care. Preventive application is further segmented into pre diabetes, obesity, smoking cessation and others. Treatment/care application is further categorized into diabetes, cardiovascular diseases, central nervous system disease, respiratory diseases, musculoskeletal diseases, medication adherence and others. Based on end user, the digital therapeutic devices market is segmented into B2C and B2B. B2C end user is further segmented into patients and caregivers and B2B is further classified into providers, payers, employers, pharmaceutical companies and others. Geographically, the global digital therapeutic devices market has been segmented into six regions: North America, Europe, Asia Pacific, Latin America, Middle East and Africa. In addition, the regions have been further segmented by major countries from each region. These include the U.S., Canada, the U.K., Germany, France, Italy, Spain, China, and Japan. The report also profiles major players in the digital therapeutic devices market based on various attributes such as company overview, financial overview, SWOT analysis, key business strategies, product portfolio, and recent developments. Key companies profiled in the report include Proteus Digital Therapeutic Devices, Omada Health, Inc., WellDoc, Inc., Livongo Health, Noom, Inc., Ginger.io, Inc., Propeller Health, 2Morrow, Inc., Canary Health, Mango Health, BiogeniQ Inc., Twine Health, Inc., Glooko, Inc., Firstbeat Technologies Ltd, Claritas MindSciences, Big Health, Nanobiosym, Inc., Dthera Sciences, Jintronix, Inc., Virta Health Corp, Zest Health, LLC, Meru Health, Inc., HealthMine, Inc., Pear Therapeutics, Inc., BioTelemetry, Inc., Blue Mesa Health, and Digital Therapeutics.